With Readly you can read Isambard Kingdom Brunel and thousands of other magazines on your tablet and smartphone. Get access to all with just one subscription. New releases and back issues – all included. Three names.Three people in one. Born in Portsmouth on 9 April 1806, there was Brunel the great engineer, who would habitually throw out the rulebook of tradition and established practice, and start again with a blank sheet of paper, taking the technology of the day to its limits - and then going another mile. Then there was Brunel the visionary, who knew that transport technology had the power to change the world, and that he had the ability to deliver those changes. Finally, there was Brunel the artist - who rarely saw technology as just functional, and strove to entwine the fruits of the Industrial Revolution with the elegance and grace of the neo-classical painter. His bridges, tunnels and railway infrastructure have entered a third century of regular use, and the beauty of their design and structure has rarely been equalled. The three decades, from the 1830s to the 1850s, saw an explosion of technical excellence, and it was Brunel who in so many cases lit the blue touchpaper. He did not always get it right first time, and it was left to others to reap the fruits of his many labours. Nevertheless, his actions fast-forwarded the march of progress by several decades. 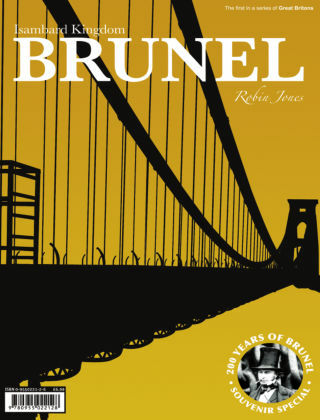 In 2006, Britain is celebrating the 200th anniversary of Brunel’s birth, with a multitude of events large and small, for the family, the steam buff and the academic alike. It will be a wonderful year, in which Isambard’s many legacies will be re-examined - and revisited. The landmarks will take centre stage, of course: the spectacular Royal Albert Bridge at Saltash, the magnificent glass-roofed terminus of Paddington, Maidenhead bridge with its elliptical arches that many said would never stand up, the stupendous Clifton Suspension Bridge, completed shortly after his death, to his design by a team of admirers, Bristol’s original Temple Meads station, the Dawlish sea wall railway route - everyone’s favourite section of the national network, and many more.